Hilltop Christian Nursery School, under the direction of the First Presbyterian Church of Mendham, is a preschool program designed as a ministry to the congregation and to the community. We believe that children are a gift of God, unique and special, entrusted to our care with a particular responsibility of helping every boy and girl to know and rejoice in God's love for them. Therefore, we seek to create a safe environment that will nurture one's distinctive personality by assessing a child's individual gifts and talents. 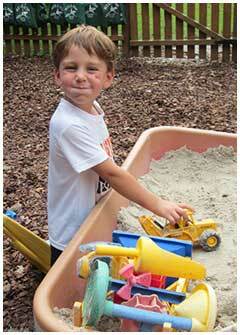 We seek to foster self-confidence, trust, creativity and imaginative uses of play. And we aspire to model the way a child's self-love and self-esteem will allow greater respect for peers and adults. We strive to meet these objectives using age-appropriate, preschool curriculum, developing basic educational proficiency, aided by the resources found within the Christian tradition, particularly in its beliefs and values. Through story, song, prayer, worship, art, drama and play, we hope to lay the foundation for the future, as a child continues to grow and learn about his/her uniqueness and comes to rejoice in God's love toward all humanity revealed in Jesus Christ. 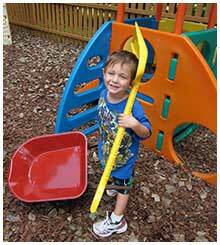 "A good early childhood program teaches social skills, how to share toys and play together. It stresses physical coordination and develops motor skills... it introduces youngsters to the joys of learning... an appetite that, once created, carries over into the school years." "It is attitude, not the acquisition of skills, that is the crucial ingredient of early childhood school. A child who is drilled for certain tasks before he or she is ready won't end up being any smarter. Doing it sooner doesn't necessarily make it any better in the long run and it can be damaging to a child's self-esteem." • To provide an environment that is safe, warm, and nurturing, as well as stimulating. • To promote the optimum physical, social, emotional, spiritual and intellectual growth of each child. • To stimulate a love of learning and a joy and the excitement of new experiences. • To foster children's awareness of others and to help them learn how to become part of a group, to share, and to take turns. • To help children develop a sense of responsibility for their own actions and for the well-being of others. • To encourage children's natural curiosity and interest in exploring their world. • To give a child opportunities for imaginative play and for creative expression in music, art, movement, and dramatic activities.